In compliance with the Inspector General Act Amendments of 1988 (5 U.S.C. app. 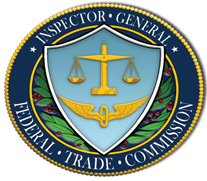 ), the Office of Inspector General (OIG) was established in 1989 as an independent and objective organization within the FTC. This Act was an amendment to the original Inspector General Act of 1978 (IG Act). Under the IG Act, as amended, the OIG is responsible for conducting audits and investigations relating to the programs and operations of the FTC. Audits are conducted for the purpose of finding and preventing fraud, waste and abuse and to promote economy, efficiency and effectiveness within the agency. OIG investigations seek out facts related to allegations of wrongdoing on the part of FTC employees and individuals or entities having contracts with or obtaining benefits from the agency. The OIG conducts audits, evaluations and reviews of agency programs and activities. In general, these activities involve an examination and analysis of FTC bureaus or offices, programs or operations. The auditor may analyze and verify agency records and obtain information by interviews, questionnaires, and physical inspections. Audits are selected based on a number of factors, including (i) statutory requirements; (ii) materiality of the activity; (iii) agency staff comments regarding perceived vulnerabilities or inefficiencies; and (iv) issues brought to our attention from individuals outside the agency, including Congress, the media and the public. The OIG performs its audits and evaluations in accordance with applicable standards issued by the Comptroller General of the United States and CIGIE. Final audit reports are generally provided to the Commission, management officials responsible for implementing the recommendations, and to the agency's executive director. Audit and evaluation reports are public documents and are available on the OIG's website. The OIG also prepares an annual report of the top management challenges facing the agency. This report is included in the agency’s annual Agency Financial Report to Congress. The OIG investigates allegations of fraud, waste, abuse and/or misconduct involving FTC employees, contractors or entities conducting business with the FTC. OIG investigations address criminal, civil, and administrative violations of laws and regulations. An employee who is the subject of an OIG investigation is afforded his or her rights regarding representation and self-incrimination. In addition, all OIG investigations are conducted in accordance with the “Quality Standards for Investigations,” published by the Council of the Inspectors General on Integrity and Efficiency. The subject of an OIG investigation can be any agency employee, an FTC contractor, consultant or a person or entity involved in alleged wrongdoing affecting FTC programs and operations. FTC employees have a duty to cooperate with the OIG and must respond to questions posed by an OIG investigator unless they have been advised that they are the subject of a criminal investigation. Intentional falsification or concealment of a material fact in connection with an OIG investigation could constitute a violation of law and result in disciplinary action or criminal prosecution. At the conclusion of an OIG investigation, the OIG investigator prepares a report that sets forth the allegations and an objective description of the facts developed during the investigation. The investigative report does not include recommendations. The OIG refers investigative reports that identify criminal activity or fraud to the Department of Justice for possible prosecution or recovery of monetary damages and penalties. If administrative misconduct is found, the OIG forwards the report to the appropriate management officials for consideration of disciplinary action. OIG investigative reports are not public documents and are not available on the OIG website.